French Beans are also known by a variety of names such as kidney beans, flageolets and haricot beans - these names refer to the beans when left to mature fully. Perennial, but grown in UK as half-hardy annual. Full sun, sheltered from wind. Well-dug water retaining soil. Simple to grow, delicious tasting and very nutritious - a few of the reasons for you to make room for French Beans in your vegetable plot. The taste is always better than those bought in the shops, because you can grow varieties not suitable for commercial production. You also choose when to harvest them - just before they are needed for cooking. In normal circumstances they can be harvested between early July to mid October. If you have cloches, they can be ready to harvest in mid June. French beans prefer a sunny, sheltered site because it gives protection from cold winds which helps at the seedling stage and later on during the pollination phase. If the climbing type is to be grown (as opposed to the dwarf variety), remember that they will need support to 1.8m (6foot) and that they will cast a shadow over any nearby low-growing plants. 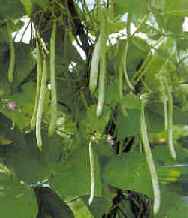 Climbing French Beans make ideal companions lettuce, beetroot and other low growing vegetables which appreciate some shade in midday heat. French Beans prefer a rich soil which has plenty of organic material in it. They have a deep root system, so digging should be to a spade and a half's depth, incorporating compost or other organic material during the process. If possible, prepare the soil a month or so in advance of sowing the seeds, mid April is a good time. French Beans are very frost-tender at the sowing and seedling stage and if unprotected, will in almost all cases damaged by any degree of frost. Where the seedlings have appeared above the soil surface and a late unexpected frost strikes, it is best to remove them and plant more seeds in their place. The best time to plant French Beans outside is just after the last frost, mid May (click here if you have not yet used GardenAction to automatically set the weather dates for your area). If poly tunnel or cloche protection can be provided (or if planting in pots indoors), the sowing date can be 4 weeks before the last frost date in your area. Click here to buy a poly-tunnel or cloche online from our recommended suppliers. Message: i've acquired information on the production of french beans. Message: i have require the information about to avoid the cracking seed of french beans and soybean seed. I am trying to grow some french beans the brand name is carters - and the bean type is blue lake - but I have never grown such beans before so any help you can give me would be greatly appreciated - please can you tell me do I have to nip out the top growing bud when they reach 6ft - and also how do I make them flower then produce beans from that - I have had them in the ground since may - and nothing yet - no beans - but I have a lot of leafy plants - please help !!! Message: please can you advise me on what type of soil to plant french bean. Message: I have grown some French Beans in large pots in shop bought, peat free compost which are now outside (in the north east of England. I feed them weekly and water them most days when it doesn't rain. The plants are strong and healthy, but very few beans are growing straight and have assumed a "U" shape. What am I doing wrong? Message: Please could you advice me on the best variety of flageolet beans for the Edinburgh area of scotland. As tried to grow them by planting in early May but not one germinated. Message: Not many people using the "please " word here. Message: Kindly send me a brochure on how to grow frence beans, and advise on the current world market prices. Message: what are the common disease likely to affect frenchbeans and what are the respective curative measures? At what stage is this crop prone to infections and how can it be protected from the infections? Message: How much money can one make by growing french beans on an acre piece of land. Message: I grew a good crop of dwarf french beans last year. As they are a'perenial'I've cut them back to 2 ins and covered with mulch. Can I expect a re-growth this year? Or should I start again and sow some seeds? Message: Can i please get information on the current production statistics of french beans in uganda? Thanks a lot. Message: I want to know how to cultivate the french beans for commercial purpose. Message: am mbowa from Uganda, i wana know how togrow french beans. Message: I live in France and this year I have a bumper crop of French beans. If I leave them to mature and dry on the plant can I then use them as any other dried bean?